The AUTEAM Industrie-Elektronik GmbH has been successful in the development and manufacture of control systems for plant and mechanical engineering (including in the control and regulation technology for crystal growth equipment) since 1990. The Steremat Elektrowärme GmbH has over 55 years of experience in the field of induction heating and over 45 years in the field of crystal growth. The two companies, along with WIAS and the Leibniz Institute for Crystal Growth (IKZ), formed a consortium that was funded for a period of three years by the federal states of Berlin and Brandenburg, as well as by the European Regional Development Fund (ERDF). The most important production methods for semiconductor bulk crystals start at high temperature with a melt, and then the crystal is obtained on controlled cooling. During the so-called Czochralski process and its variants, the crystal is pulled from a rotating melt. 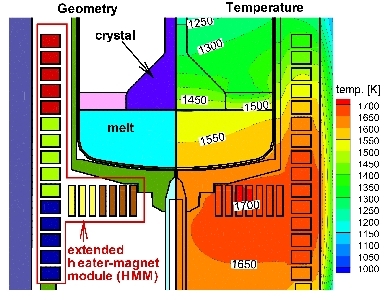 In order to achieve a homogeneous crystal, three requirements must be met: one needs, preferably, a spatially and temporally homogeneous temperature, a controlled flow within the crucible, and a convex interface between melt and crystal. The desired process up-scaling (increase of the production device in order to achieve larger crystals) leads to serious complications. This new requirement calls for major changes in the growth device, and new experiments to determine the new optimal parameters become necessary. To be able to produce larger crystals with the same quality, one may even need some additional technical equipment. For example, traveling magnetic fields are successfully used to control the melt flow during Si growth. But the application of this new technology to the growth of III-V compounds leads to an unfavorable high power consumption, since the magnetic fields are typically generated by induction coils placed outside of the growth apparatus so that the thick walls of the pressure chamber significantly diminish the applied magnetic field. For the reliable and efficient mathematical simulation and optimization, a coupled system of partial differential equations on a complicated, nonsmooth cylindrical domain had to be solved. The scientific software tools WIAS-HiTNIHS and NAVIER were extended and applied to the numerical treatment. Within the KRISTMAG project, the partners could show that an internal heater-magnet module can generate traveling magnetic fields that are able to control temperature, flow, and interface boundary in the favored sense. Several pilot devices have been manufactured, a couple of patents were filed and awarded. The groundbreaking nature of these developments was recognized by the Innovation Award Berlin-Brandenburg 2008. The simulations performed greatly contributed to the modified system configuration and delivered optimized parameter configurations for its operation. A resulting cooperation project between the same partners and other companies, dealing with controling the growth of silicon for solar cells from the melt by using traveling magnetic fields, has taken place. 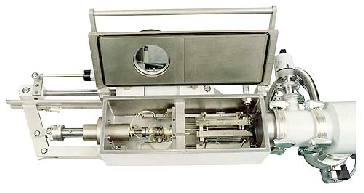 The Bähr-Thermoanalyse GmbH has been a successful manufacturer of dilatometers for 20 years. This medium-sized German company is a leader in the field. The following example was part of a two-year project between WIAS, the Department of Ferrous Metallurgy at RWTH Aachen University and the Bähr-Thermoanalyse GmbH. It was financially supported by ZIM, a funding program of the German Ministry of Economics and Technology to support small and medium enterprises. The starting point for this project was a mathematical result. In a joint fundamental research project with the Department of Ferrous Metallurgy of RWTH Aachen University funded by the German Science Foundation (DFG), we were able to prove that the complete phase transition kinetics for two growing phases can be uniquely identified from dilatometer measurements. Such a dilatometer (see figure) is a device to measure the deformation and temperature evolution subject to controlled heating and cooling. State of the art in dilatometer data analysis is that it is used solely to detect the transformation temperature for the onset and end of phase transitions. In the case of more than one phase transition, the detection of the final phase fractions up to now requires costly micrograph section analysis. Since induction heating is not only used in the heating stage but also to realize slow cooling rates, the mathematical model includes thermo-mechanics and an eddy current formulation of Maxwell's equations. The phase kinetics can be computed from an inverse problem using a Gauss-Newton method. To obtain reasonable computing time it is indispensable to reduce the resulting model exploiting the symmetries of the problem. After one year an identification algorithm for the fast cooling has been developed and implemented. Experiments to validate the numerical approach were conducted at RWTH Aachen University. In cooperation with the company, we have investigated ways to enhance the reliability of the solution to the inverse problem by a consequential use of all available experimental data.